Note: Twitter 110 is part of the Twitter curriculum for Social Media University, Global (SMUG). Here are some great tools that enable you to automatically use one of your social media tools to update others. They save you double-entry of the same information, and also help ensure that your profiles don’t go stale. 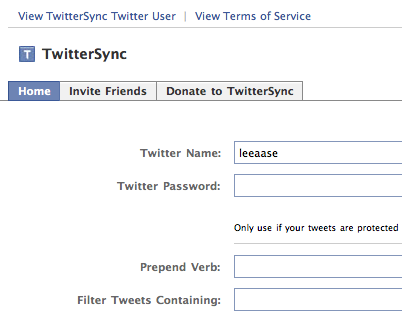 Twittersync is a handy Facebook application that turns your latest Tweet from Twitter into your Facebook status update. This is really helpful for me, because I’m notoriously bad at updating my Facebook status. It’s not that I don’t spend time in Facebook; it’s just that I’m doing other things instead of updating status. Update: See Nathon’s comment below, about why Twittersync isn’t working and the alternative method for updating your Facebook status through Twitter. Twitterfeed, by contrast, takes any RSS feed, such as this one from my blog, and uses it to create Tweets in an account of your choosing. 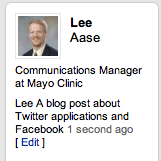 For Mayo Clinic’s Twitter account, for example, I connected Twitterfeed to our RSS feed of news releases. That way if people want to use Twitter as their all-purpose river of news, we can make sure the Mayo Clinic tributary is flowing into it. And tonight I just added the SMUG feed to my personal Twitter account. I have previously Tweeted about new blog posts. Now I don’t need to remember to do that anymore. By combining Twitterfeed and Twittersync, I can write a post to my blog and have that fact posted both to Twitter and to my Facebook status. I like both of these services, and another that’s really helpful is Twittermail. One of the most irritating parts of mobile Tweeting is that when you do it via SMS text message it’s really slow. At least for me. But with Twittermail I have an e-mail address I can use to send a Blackberry e-mail message, which is much faster: unlike SMS, I don’t have to hit keys multiple times to select the right letters. Writing a blog post about Twittersync, Twitterfeed and Twittermail on the bus. Will publish when I get home. I did this in less than a minute with my Blackberry. It would have taken at least 2-3 minutes from my cell phone using SMS. And if I had gotten a call or a text message in the middle of it, I would have had to start all over. 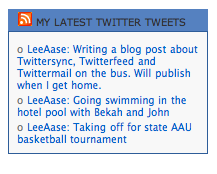 So now, by importing my Twitter RSS feed into the sidebar of my blog, I can have everything perfectly synchronized. If I use Twittermail, it will feed Twitter, which will update my Facebook status and update my blog’s sidebar. If I use Twitter or Twhirl to Tweet, that likewise works through all my other platforms, including FriendFeed. The only site that doesn’t feed the others is Facebook: the updates go in, but they don’t go out. That’s not really a problem to me, because as I said, I was lousy at updating my status there. So I’m better off using the other tools to publish my updates. What’s left out of this automatic goodness? My LinkedIn profile. I don’t really go there much anyway, usually only in response to a request to add me as a contact, but this openness to bringing in outside data is something LinkedIn could improve. It would make my LinkedIn profile less stale. If anyone knows of an application that uses Twitter to update LinkedIn status, I would be glad to hear about it and to help publicize it. The other benefit of Twittermail is it sends me digests of Tweets that have responded to mine. So if I haven’t been engaged in Twitter for a few hours, and if someone has sent an @LeeAase reply, it comes to my e-mail inbox instead of just being several pages down my Twitter timeline, where I might have missed it. Join Twitter if you haven’t already. Follow me and I’ll follow you back. Sign up for Twittermail so you can easily Tweet via e-mail, either from your desktop or PDA. Extra Credit: If you have a blog, get Twitterfeed to send your blog posts cascading through your Twitter and Facebook status updates. Hear hear on the need for this to expand to other services, like LinkedIn. I wouldn’t be surprised if it’s opened up soon, though… They do roll with the Open Social crowd, after all. I agree with the LinkedIn profile getting stale. It’s annoying not being able to update via Twitter or other options. Thanks for the update, Nathon. I had wondered why my Facebook status wasn’t being updated by Twitter. I got it to work now. Regarding Nathan’s update about Twittersync. So I accessed the Twitter app on facebook and set it up. But it doesn’t appear to be updating my status on my wall. It may be including updates in the feed to my friends, though. Is that how it’s supposed to work? I thought I’d see status updates from Twitter posts on my Facebook wall. Previous Previous post: Can YouTube Beat Facebook Video Quality?